Sharks don’t get cancer. We’ve all heard this claim, and sadly such beliefs have led to the death of large numbers of sharks for the supposed curative powers of their various body parts. The first ridiculous assumption to dispense with is that even if sharks DIDN’T get cancer, that in no way means that any part of a shark can CURE cancer in humans! That senseless correlation aside, sharks in fact do get cancer, and most marine biologists and divers who spend time observing sharks in the wild will see animals with lesions suggestive of cancer. 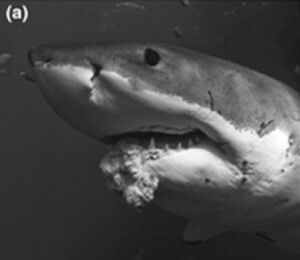 A new report by Robbins et al documents tumors in a white shark (Carcharodon carcharias) and a bronze whaler shark (Carcharhinus brachyurus) in Australia, the first reports of cancer in lamnid sharks. The first animal, an adult male white shark, had a large (30 cm x 30 cm) mass protruding from the lower jaw (see the figure, from Robbins et al). Other than loss of teeth in the region of the lesion, however, the shark appeared in good condition. The bronze whaler shark was observed over a period of four years, first presenting with a dorsally located mass behind the right eye. While the initial mass did not change over successive years, by years 3 and 4 the animal showed additional tumorous lesions on the dorsal surface of the body. Despite the increased masses, this shark also appeared to be in good condition throughout the four year observation period. The authors suggest that the additional tumors may indicate metastatic disease in this animal. The authors discuss the possibility that increased reports of tumors in marine animals may be linked to increasing ocean pollution. As apex predators, sharks are known to accumulate high levels of many potentially toxic compounds, but such a cause cannot be assigned in these particular animals. So sharks most certainly do develop cancer --- then why has the “Sharks don’t get cancer” refrain persisted? Probably for the same reason that few wild animals of any species are observed with cancer. The wild is an unforgiving place -- sick animals do not last long, and dead animals are quickly scavenged. One could just as easily say “elephants don’t get cancer”. For marine species there is the added fact that dead animals quickly sink from view, making them even less likely to be found than dead terrestrial species. The article is: Robbins, R, Bruce, B and Fox, A. (2013) First reports of proliferative lesions in the great white shark, Carcharodon carcharias L., and bronze whaler shark, Carcharhinus brachyurus Gunther. Journal of Fish Diseases, Online before print.